So I noticed some crazy effed up leaves on my peach trees this past week. Looked like a leaf roller or something – yeah, it turns out I have a fungal issue with peach leaf curl. Treatment this year will be taking the affected leaves and composting them – and next year it looks like a simple copper spray, or perhaps compost tea, may be enough. Still, pretty frustrated that my first years buds and growth were rendered moot. Live and learn. The trees aren’t really big enough to support much fruit this year, but you still hate to see them in such a state. 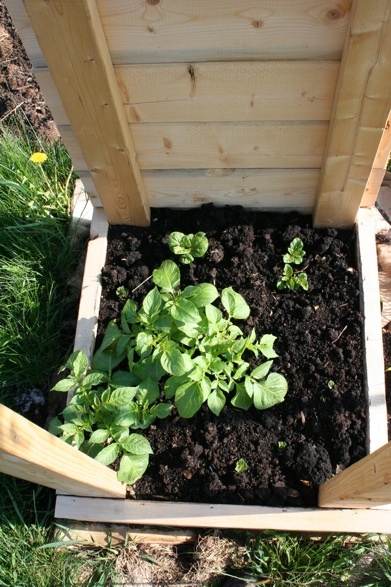 On the Good side, – the potato tower is doing fabulous! The two larger plants are putting on an inch of growth a day thanks to the compost rich soil, slow rain, and 1″ of worm castings. Thus far it is VERY encouraging. To top it off, I (finally!) bought a pair of gooseberry plants from a local native/edible landscaping nursery. I am excited to see how big they get, how the fruit tastes, and how bad the thorns are. They are fruiting out already so updates will be coming! 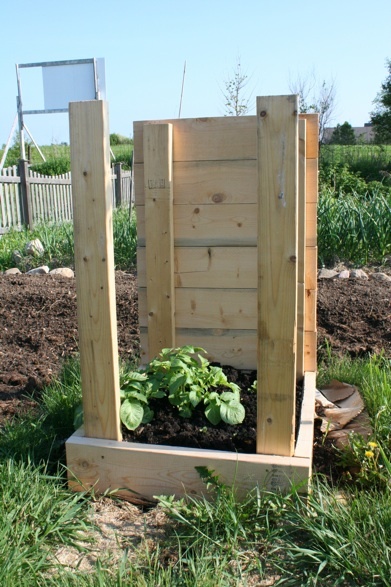 And finally, my personal favorite of the day – two of my compost bins crested 152 degrees today! I typically struggle to get enough nitrogen in my piles as they are mostly coffee grounds, and with an entire winters haul of materials (almost 3 yards!) I needed to get the piles cooking HOT before I run out of room. So I mixed in 2 cu ft of lawn clippings for each 6″ of partially cooked compost, wet it down a bit and let ‘er rip. The first week I hit 142, but I must not have had it wet enough, because after several days of rain, they settled down about 4″ and are cranking along at 150+. That is a personal best and should net me a very fine finished product if I can keep it up. Hopefully I can let every other cutting lie on the lawn and still keep the piles going this strong. How exciting! I have a dream: a backyard filled with no till beds, deeply mulched and brimming with worms producing a fertility so rich you can literally smell it. Weeds pull easily from the humus rich tilth and most of the toil is spent in harvesting, making compost, and sipping tea while watching the kids play. My reality is far different thanks to my arch nemesis: Quack Grass. We tried no till last year. The soil came alive seemingly instantly, only to be completely overridden by Quack… that bed had hundreds of 7′ long (yes that’s feet) rhizomes in it this spring. The problem is primarily that my lawn is riddled with quack which can gather energy and send it through the rhizomes shooting into my garden beds giving them insane tenacity. But I don’t give in easily. My dream will be a reality: I’m stubborn as a mule, am possessed of wicked amounts of energy, and just happen to own a $4000 rototiller. I will not be denied. First step is get he effin quack out of the beds. 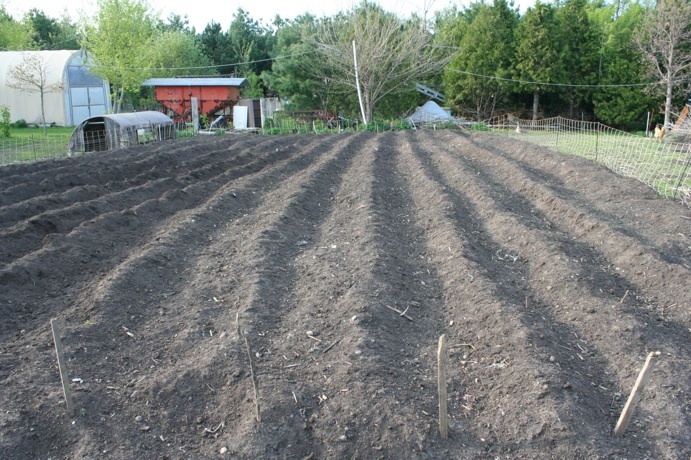 The beds that I did not no till last year were easier – I forked them and shook all the soil through the times – that’s 3 yards of soil per bed – and chucked the rhizomes into a wheelbarrow. Next up is getting the quack out from under the field stone I use for bed edging. 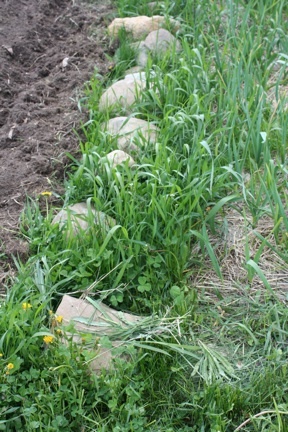 That means moving 100 30# stones per bed throwing them about 4′ and taking the Grillo to the perimeter for 3 passes to hack the rhizomes into bitty bits that are less able to outcompete my clover. 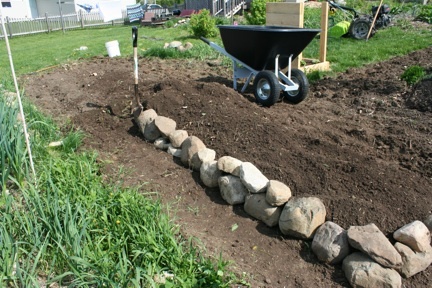 The picture above is a bed in complete disarray – the stone is removed, the soil was tilled last weekend and left to bake in sun. The quack (of course) resprouted, but the rhizomal supply lines to the lawn were severed. The bastards are mine! I am terracing it with stone again. As I move the soil, I throw it up into a mound and let it cascade down, this exposes most rhizome bits over about 2″ and these I pull out and throw into the ‘barrow. I took this bed down to the underlying clay – about 8″ – and found another layer of uncut rhizomes several feet long. I loathe quack at an almost unhealthy level, but I absolutely respect its evolutionary hutzpah. This plant is incredible! That tilled quack will sit in the sun for a week, get tilled again, and seeded to clover. 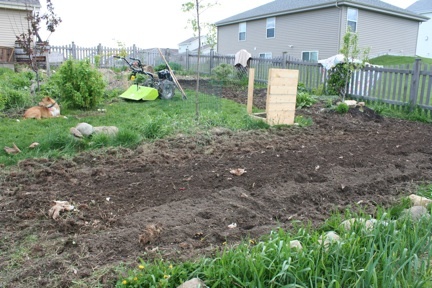 I have 7 annual veggie beds (about 70 sq ft each) as well as 4 permaculture guilds about the same size. I am about half done with irradicating the quack from them. The goal is to remove the vast majority of rhizomes within my “productive” yard and then cut a 5′ swath of lawn out as a veritable “Maginot Line” against the lawn’s quack. This, as well as all the paths, is being planted very thickly with White Dutch Clover. WD Clover is the only plant I have found to outcompete quack – as long as it is mown short and kept wet. It greens early enough in the year to prevent the quack from getting a jump, and its stolons and uber thick root mass form a nice defense. Plus I love clover almost as much as I detest quack: it fixes nitrogen, makes a great mulch, and attract beneficials. 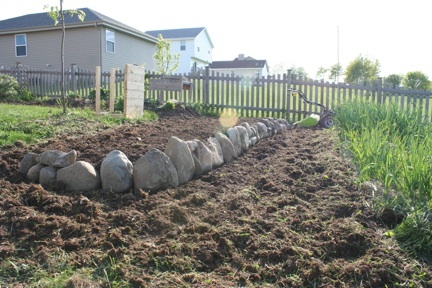 This is a syck amount of work – I spent 8 hours on 120 sq feet of bed and my arms are aching from schlepping 3 tons of stone and 6 yards of soil, but there is an Endgame here. After 3 years of experimenting with ways to beat the quack, I am convinced that this system will work; that it is possible to eradicate the quack, though it will likely take 2-3 more years before I can no till it. In the mean time it is fantastic to see how far I have come with the soil building, from grey clay and stone to 8″ of deep humus rich soil which is only waiting for me to stop tilling it 3 times a year to allow it to explode with life. Plus, I was able to mix in half a yard of Russian Comfrey and Mammoth Red Clover cuttings (cut ever so nicely with my scythe) from my fence line mulch crops and will get at least 4 more cuttings from them. The system is really beginning to work; all that remains is to purge the quack and switch to no till.